This was slightly more slice-of-life than some of the other episodes so far. Yes, they did celebrate Eid (the end of Ramadan), and someone in the community had a tragic death, but for the bulk of the people being featured, it was just another week. Shadia and Jeff got their dog back. 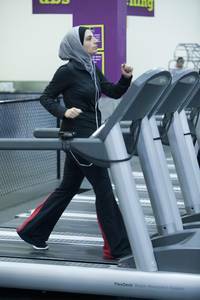 Nawal started with a personal trainer to lose the rest of her baby weight. Nina gets her husband's support for her new business venture. Fouad coached another football game. I think that the series needed a simple episode like this, especially in light of all the issues that various businesses have been having with the show. As I cover more of what took place in this episode, I'll give a little reminder as to who's-who. Zaban - [Fouad and Zaynab have been married about 12 years and have four kids. Fouad is the football coach at the local high school, and Zaynab is a part-time secretary.] The kids get gifts for the end of Ramadan, and it's very similar to Christmas when you consider that the kids ask for things like DS games and an iPad2. [LoL!] The football program is usually in the Top 10 Winningest Programs for the state, and they begin to show that merit when they win the next game 40-0. Bazzy-Aliahmead - [Nina, first-generation Lebanese-American, is an event planner who doesn't wear the hijab. She wants to open a nightclub in Dearborn. She's married to Alx, a gasoline distributor, and they have a son, Andre.] Nina tells Alex that her mom and sister don't like the club idea, but he says he's okay with it and will support her in every way he can. [that's nice. it seems that he's pretty progressive... though you would need to be to be married to Nina!] Everyone's worrying that she won't be able to be there for Andre, but she knows that she'll do just fine with her husband's help. Nina knew the guy who was shot. Jaafar - [Angela and Mike, high school sweethearts, have been married for 11 years. They have two boys and two girls. She's in marketing for an auto manufacturer and he is a Deputy Chief for the Wayne County Sheriff's Office.] Mike is a big supporter of the football program. That's really all we get for their family this episode. Amen - [Mohsen and Lila have four grown children - Suehaila, Samira, Shadia, and Bilal. Samira and Shadia are married and appear with their spouses on the show. Suehaila is 32, unmarried, and works as a court clerk and in a PR/political realm as well; Bilal (also unmarried) works as an athletic director. The Amen siblings often have dinner together.] Bilal says that people are now doing elbow-bumps a lot and there's no issue with male-female touch there. [interesting...] Bilal was giving a lecture about living in peace when the boy was shot. Sue knew both the victim and the shooter, and at the event to help youth process what happened, she speaks. She even misses the burial to witness the arraignment. McDermott - [Shadia (Amen) has a son, Adam, from a previous marriage and recently married Jeff. Shadia has piercings, tattooes, wears a lot of makeup, doesn't wear the hijab, and is a special education aide.] They lived together for a couple years at his place and are moving to get a new start. Jeff has had a lot going on... conversion, marriage, moving, and giving up a pet. Shadia vents to her mom about Jeff being upset about the dog, and they decide to get Wrigley back, though there are specific boundaries to stay off the carpet, etc. Fawaz - [Samira (Amen) is married to Ali, and they've been trying to conceive for several years. Samira recently returned to wearing the hijab, having removed it post-9/11. She is a medical receptionist] Not seen this episode.